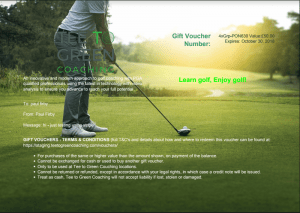 A gift voucher makes a great present, why not purchase one today, and give your friends or family member a gift that will go a long way to improve their game. Tuition vouchers can be purchased in several amounts making it easy to fit your need, and can be redeemed against any of the tuition options. Once payment has been received, you will receive an email containing your downloadable voucher, which can then be printed or emailed as required.